It’s time for an adorable wobbling craft – let’s make Baby Shark’s family, as seen on Caitie’s Classroom! 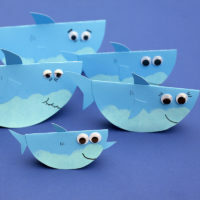 Baby Shark, Mama Shark and Papa Shark, Grandma Shark and Grandpa Shark aren’t only easy to create but they are even more fun to play with. Give them a gentle push and they will rock right and left and make kids giggle and smile. It is also a good opportunity to talk about family, extended family and familiar connections. Show photos of great-grandparents, look for facial similarities, and write relatives’ names down on paper –these are just some of the activities you can try with your kids. In addition, this craft encourages little ones to learn or review circles and sorting by size. Start by cutting five circles from blue cardstock paper: one small, two medium and two large. You can use round household items, like cups or bowl, to trace on paper. You can also use different hues of blue, light blue for the baby shark and darker blue for the parents and grandparents. Once you have all the circles, fold them in half. Paint the sharks’ belly light blue with a round paint sponge. 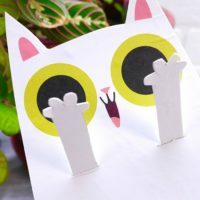 Because paper tends to curl when wet, you may want to hold the circle halves together and secure them with a clothespin. While you wait for the paint to dry, sketch fishtails and fins on blue paper and cut them out. Glue them all on the sharks. Glue the eyes and draw with a black marker the eye details, mouths and the sharks’ gill slits using three curved lines. Create the teeth with a Q-tip and a bit of white paint. Don’t forget to follow us on Twitter, Instagram and Facebook! Stef is the mom of 2 little boys and the blogger behind Non-Toy Gifts. 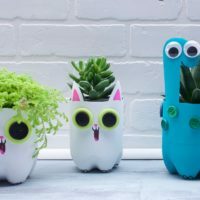 Here she shares fun and simple crafts and activities for young kids.